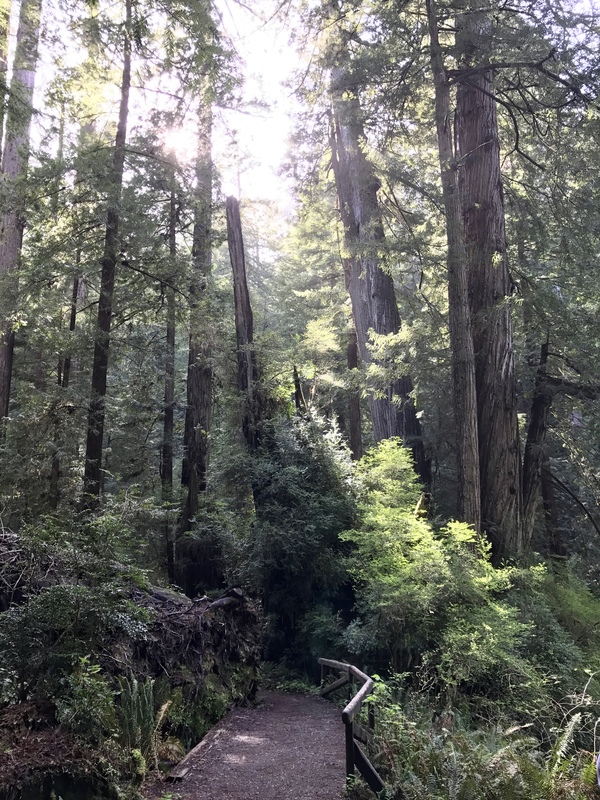 This past Monday, we continued our exploration of California’s redwood coast (and checked another national park off our list!) 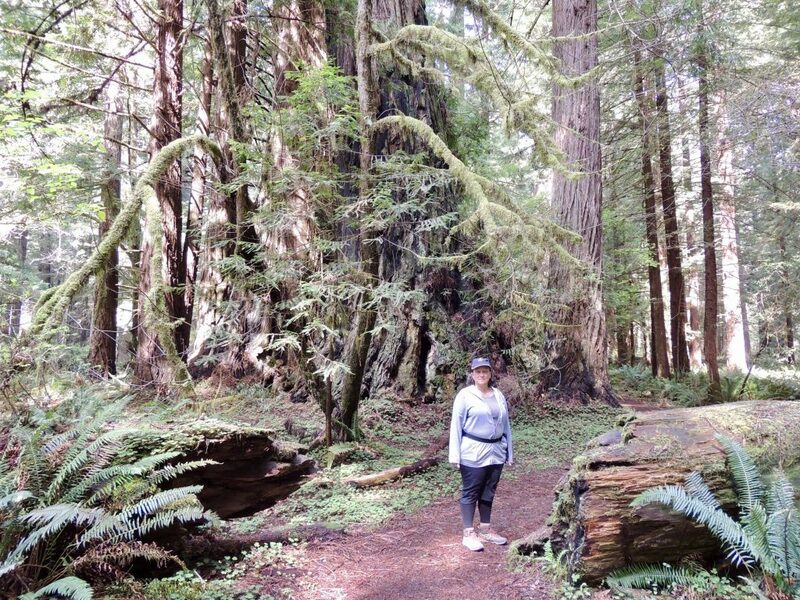 at Redwood National and State Parks. In an unusual–and according to a 15-year volunteer at one of the visitor’s centers, largely dysfunctional–arrangement, the National Park Service and the California Department of Parks and Recreation jointly manage the combination of federal lands and three former state parks. The knowledgeable volunteer suggested that we hike a 2.2 mile loop at the southern end of the Newton B. Drury Scenic Parkway. The 10-mile parkway itself, the main road in this part of the parks, had already been closed to vehicles for three months for removal of a downed redwood across the road, and has no timetable for reopening. (An example of the dysfunction cited by the volunteer.) The loop starts near the Elk Prairie Campground Visitor’s Center, and follows the Foothill Trail up the east side of the Drury Parkway, and then returns to the Visitor’s Center via the Prairie Creek Trail on the west side. 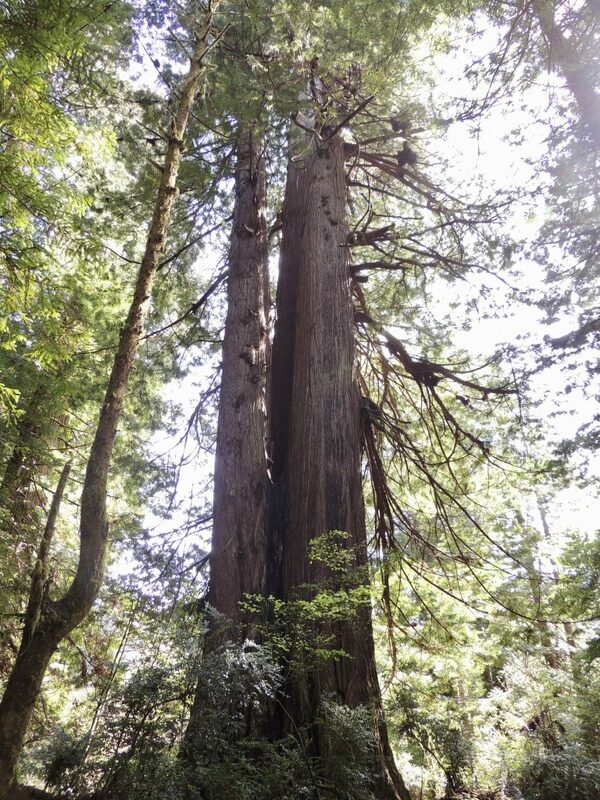 Even though this area, like the Founders Grove we visited a view days earlier, is an old-growth redwood forest, it felt quite different to us. Here, more sunlight reaches the forest floor, which is covered with lush ferns and other plants as a result. 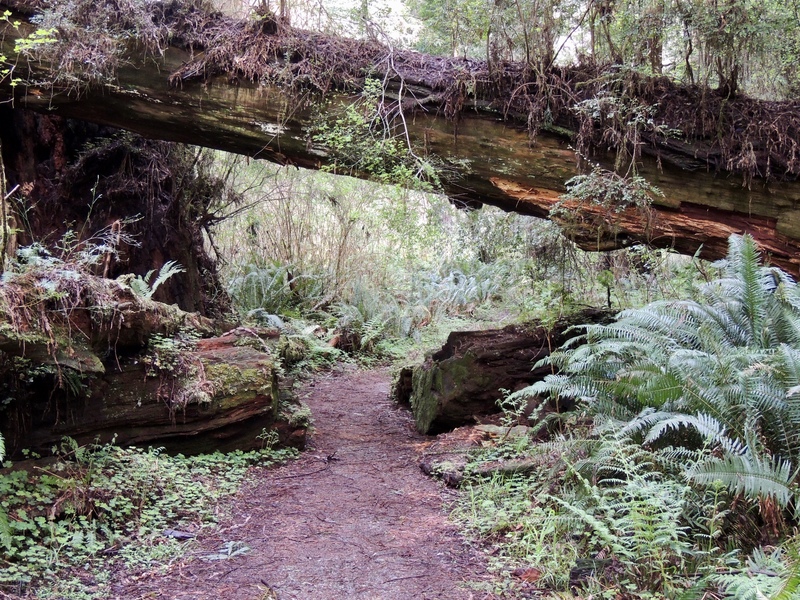 It felt to me like something right out of Jurassic Park, so we weren’t too surprised to learn that an enormous tree near the start of the trail was featured prominently in one scene in Jurassic Park 2. Some of the speeder chase scenes set on the forest moon of Endor in Star Wars VI: Return of the Jedi were also shot nearby. 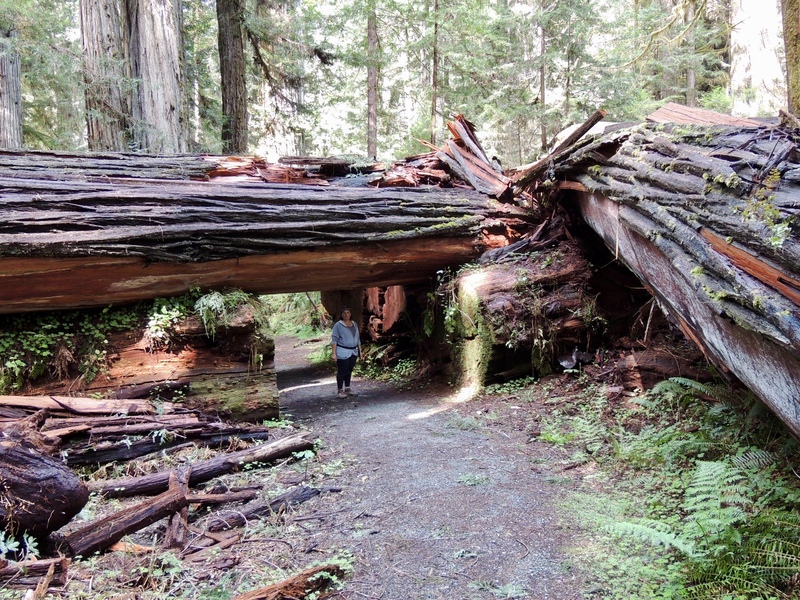 Redwoods have shallow root systems, so they naturally tend to be felled by high winds at some point in their lives. 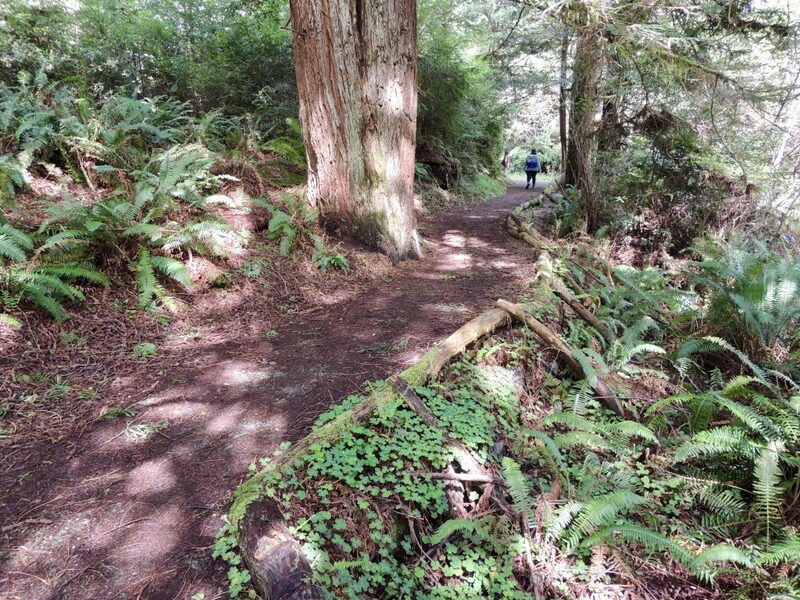 In some areas, the trail was routed through spots where the downed trees had split or rotted away on their own. 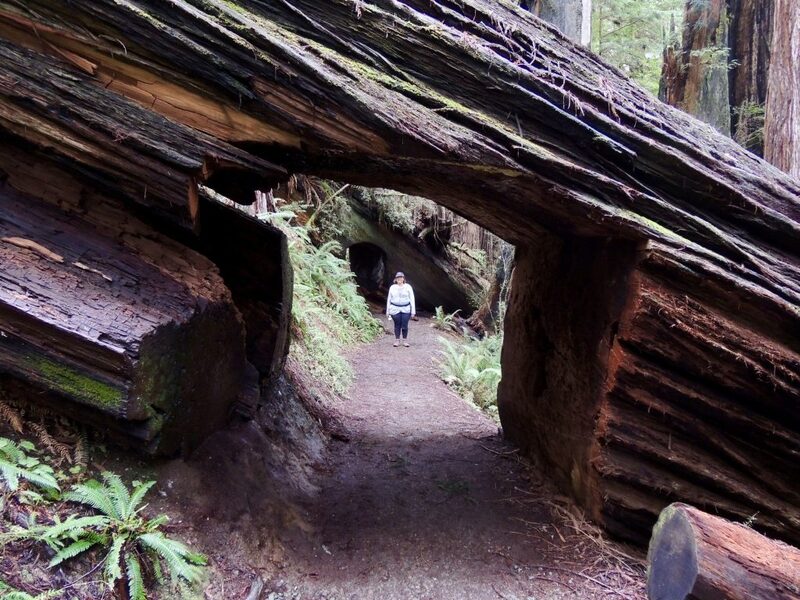 But where trees had fallen across the trail more recently, the park service cut out sections so the trail could get through, creating some spectacular underpasses and tunnels. From around a curve on the Foothill Trail before we got to this point, it looked like the top tree was blocking our way! 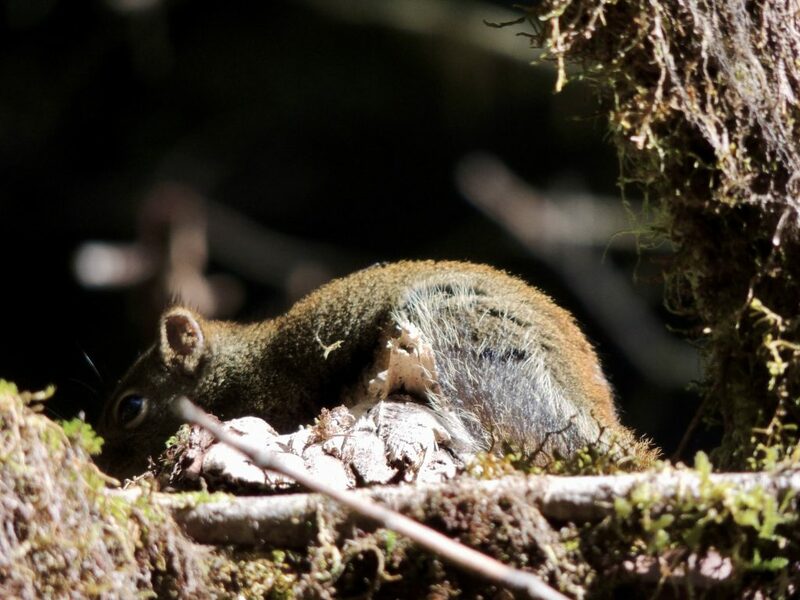 We spotted this little guy on a tree branch near the trail, probably hoping for a dropped crumb or two. 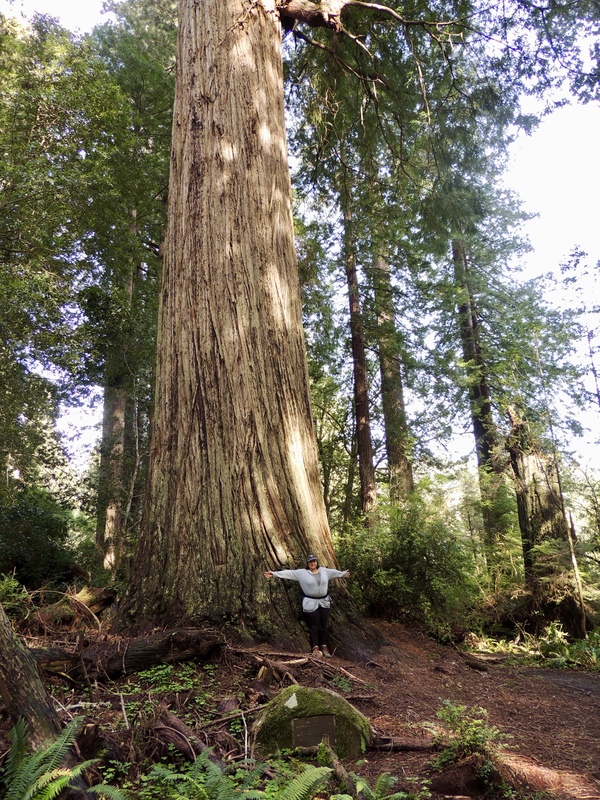 OK, so the Big Tree’s statistics are pretty impressive: 304 feet tall, 21.6 foot diameter, 68 foot circumference, and an estimated 1500 years old. As the trail crossed back over the road, we got a nice glimpse down the empty Drury Parkway. It would have been a nice drive if it had been open, but on the other hand, hiking the nearby trails without the noise of cars on the road was enjoyable too. 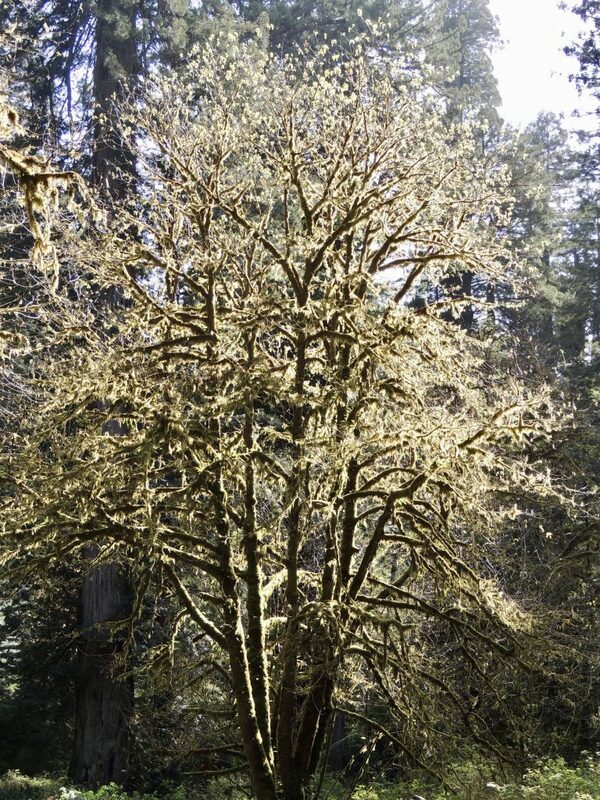 Just before we left the parkway, we saw this moss-covered tree (not a redwood, obviously) that seemed to glow in the sunlight. From the return trail, we were treated to frequent views of Prairie Creek, which the trail generally parallels, and crosses over in several places. I could listen to this peaceful sound all day! 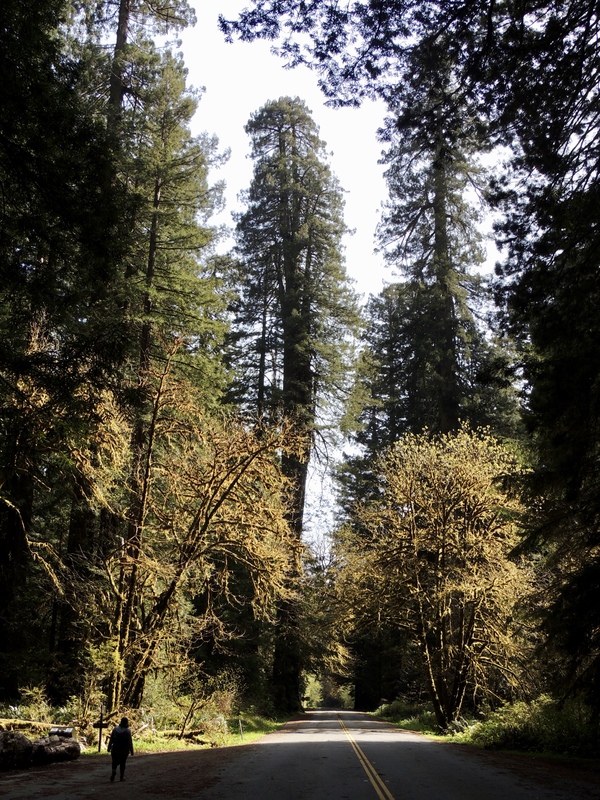 The redwoods on the west side of the parkway were just as impressive as the Big Tree, if not even more so. 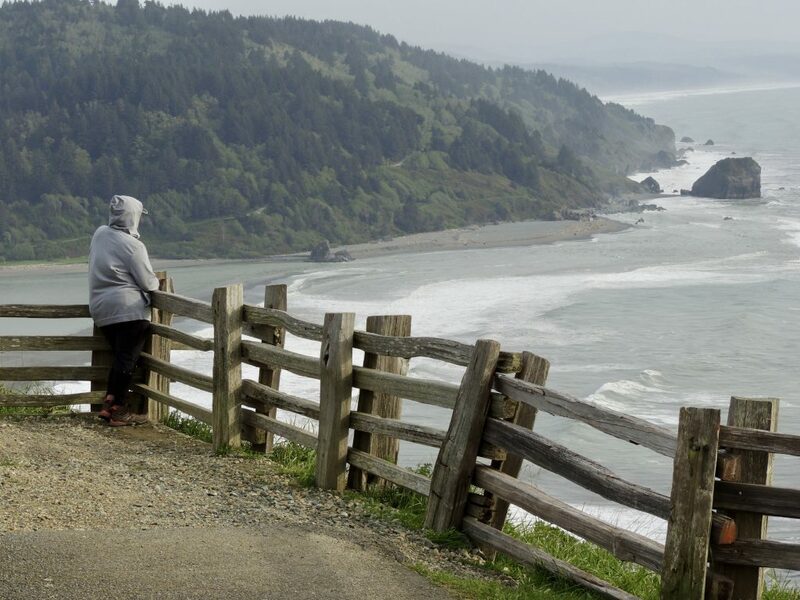 After we returned to our truck, we drove a few miles north to the Klamath River Overlook, on the north side of the mouth of the Klamath River where it empties into the Pacific Ocean. This was another suggestion from the volunteer at the visitor’s center, and an “off-the-beaten-path” sight we surely would have missed except for his local knowledge. The overlook is perched 900 feet above the water. By this time, the sun was setting and the air was getting colder. So we drove the 45 minutes back to Trinidad, and after a quick dinner we caught the Trinidad Memorial Lighthouse in the fading dusk. 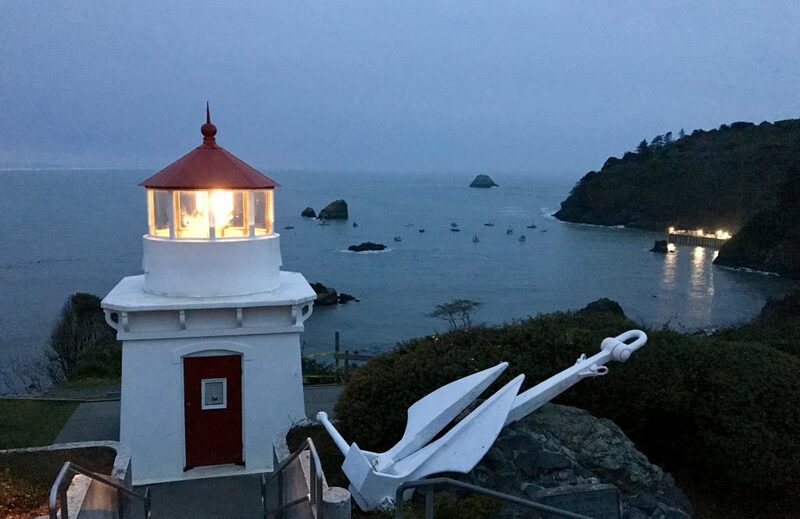 The lighthouse was built as a memorial to local sailors lost or buried at sea. 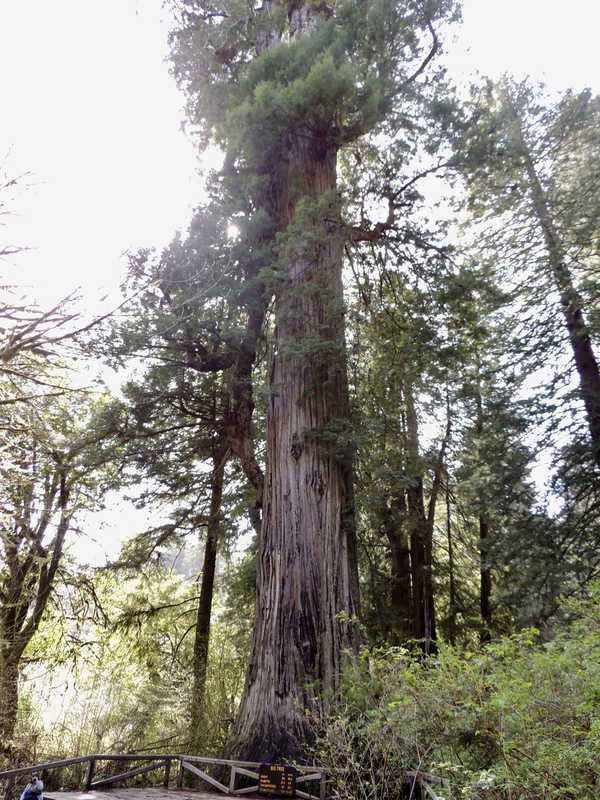 After our visits to the California redwoods, I can tell you that he was absolutely right. Words and photographs can’t do them justice; you owe it to yourself to see them in person.